David D’Amico has been active in limited physical fitness for more than forty years. In his “mature” years beyond his seventies, he developed calcification of two vertebrae requiring him to do some physical therapy. In 2010, he began working with Personal Trainer, Amee Puckett. She has enabled him to stay in shape and even use some muscles he didn’t even know existed! 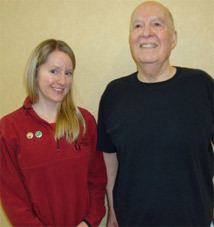 David has noticed many improvements as a result of his regular fitness routine at Milestone. A few months ago, he was still using the elevator instead of stairs. Now he is able to walk up the stairs! His daughter in Pennsylvania was very impressed when he came to visit her last Fall. Even on a recent trip to New York City, he was able to walk ten blocks without a cane! David hopes to continue to improve his fitness level, which is necessary for him to continue his healthy lifestyle. Who knows what David will accomplish with his improved physical fitness in 2012!